Day in and day out there are advertisements on television to help you lose weight, but they never tell you just why you should lose weight, other than for vanity reasons. Being overweight can lead to one of the most common conditions seen around the modern world, Type 2 diabetes. Type 2 diabetes is based upon the deposits of fat in your body. As the body has more fat cells, it prevents other cells from taking the glucose which leads to a higher amount of glucose in the bloodstream instead. All it takes is to reduce your body weight between five and seven percent, along with 30 minutes of exercise five days a week, and your risk of developing Type 2 diabetes drops by 58 percent. Fat has a huge impact on your heart and increases your risk of a heart attack. Being overweight also affects the cholesterol and sodium levels in the body, which is the leading cause of heart attacks in the developed world. There is also an increase in blood pressure in those who are overweight, which means that your heart is working too hard. There are more heart disease related deaths due to this, such as angina or sudden heart attacks; those that cause death with no early symptoms. Just losing up to ten percent of your body weight will help to lower the risks of heart disease and heart attacks. Stroke is still one of the top five causes of death, and is due to a problem with the flow of blood to the brain. There are many reasons linked to the causes of a stroke and being overweight is one of them, specifically due to a person’s overall body mass. This is because the arteries get narrowed and blood clots stop the blood from being able to flow to the brain. Stroke is also linked to high cholesterol and a lack of exercise, which is seen in many overweight people. 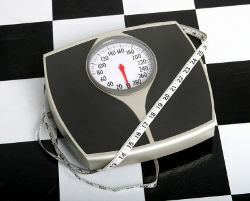 While those who are not overweight are still at a risk of stroke, it makes those who are overweight at more of a risk. By having an extra 20 percent in body fat you are 50 percent more likely to suffer a stroke. These are by far not the only effects that being overweight have on the body. There are plenty of other reasons why being overweight is unhealthy. However, these are the most life threatening of cases when it comes to high amounts of body fat. It is extremely important to eat a healthy, balanced diet and continue to exercise for at least 30 minutes, five days a week. By losing your excess weight, you are not only going to look and feel better; you’ll dramatically reduce your risk of developing these frightening conditions too.